Jeanne Kern, owner of The Vine restaurant in downtown Elkhart was no fan of cheesecake. That was then. Now she is a true aficionado, if it is made by Charles Dean, that is. “It is the best ever,” Jeanne says. Charlie, as he is better known, is the Executive Sous Chef at the Vine. He is a humble guy who lets the food he prepares do the talking. Charlie’s co-worker, Alexandra Forray enjoys watching Charlie in action. “He is so passionate about cooking,” she says. “He puts his heart into everything he does in the kitchen.” Alexandra also rants about Charlie’s dessert-making skills. “He is masterful,” she says. Jeanne agrees. She admires how Charlie has really started to blossom as a chef. “Charlie is creative, capable and confident,” she says. That is high praise for any chef. 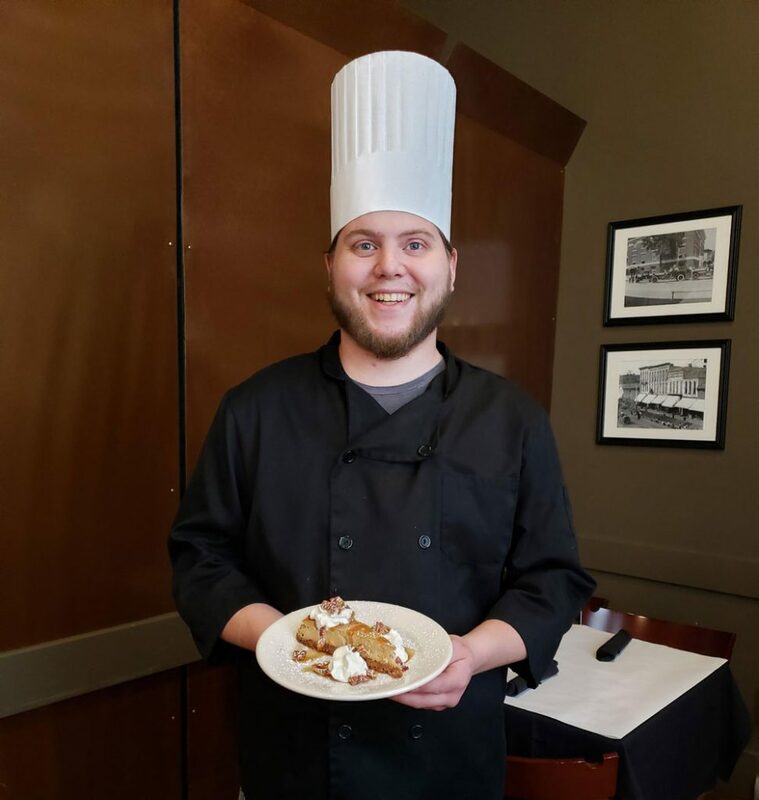 He is making the Culinary Arts program at the Elkhart Career Center, where he was trained, very proud. When not in the kitchen, Charlie is often found near one of Elkhart County’s rivers or lakes. He is a dedicated angler. His love of fishing has even led him to make his own poles. Recently, Charlie has taken to ice fishing. This winter, he took a long weekend to travel up north and give it a go. Charlie not only works in downtown Elkhart, but it is also where he resides. He is an avid supporter of the downtown businesses and venues. Alexandra says, Charlie “is one of a kind. We are all so grateful to be in his presence at work.” You should try Charlie’s cooking. If you do go to The Vine, make sure to save room for dessert. Jeanne recommends the cheesecake.